Thousand Oaks, CA – May 2016… Sterling Audio unveiled a new line of professional headphone amplifiers, with three models to serve a variety of studio and live-sound applications. Combining clear, high-quality audio with simplicity of operation, these new headphone amplifiers feature gold-plated inputs and outputs for superior conductivity, power-on status LEDs, and low-noise operation. Designed primarily for personal recording studios and other applications where space is at a premium, the four-channel Sterling S104HA offers one rear-panel, stereo, TRS line input and four front-panel stereo headphone outputs, each with a 10-increment level slider. The S104HA comes in a sturdy and lightweight aluminum chassis with non-slip rubber feet and is powered by an external 12 VDC supply for low-noise operation. Recording studios and broadcast facilities that require more flexible inputs and a more robust chassis should consider the four-channel S204HA, which is housed in a rugged aluminum chassis enclosed with a rubberized casing to withstand the stress of constant use. The S204HA’s front panel sports an unbalanced stereo line input and four rotary level knobs for the headphone outputs. The rear panel offers four stereo headphone outputs and balanced TRS left and right line inputs on the rear panel. Like the S104HA, the S204HA is powered by an external 12 VDC supply. 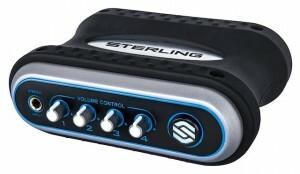 For more demanding professional applications, Sterling presents the flagship S418HA, which features two stereo main line inputs, eight direct line-level inputs for individual monitor mixes, and eight discrete, stereo headphone amplifiers, each with two headphone outputs-all packaged in a steel, 1U professional rack chassis. The S418HA can operate in stereo or mono and provides an output level control and clip LED for each channel. Its low-noise, 15V toroidal transformer delivers the superior output power and headroom required for professional use. An elegant faceplate with backlighting enables easy operation in low light environments. Parallel, balanced 1Ž4″ outputs enable you to cascade additional S418HAs so your headphone system can grow with your needs. The S104HA will carry a street price of $49.99, the S204HA will sell for $79.99; both amps are available now. The S418HA will be priced at $149.99, and will be available in September. All three amps are available at Guitar Center as well as guitarcenter.com and Musician’s Friend.